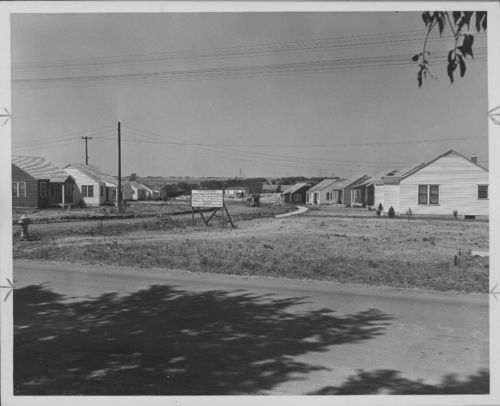 This black and white photograph shows a housing project in El Dorado, Kansas. In the foreground, a sign by Arnall & Matlock Building Contractors urges veterans to take advantage of the G.I. Bill of Rights to purchase one of the newly built homes in the development. Through the G.I. Bill of Rights, an honorably discharged veteran could secure a low interest loan to buy their home.